After a break of just over two months, MMU will return to action when they face the University of Strathclyde on Wednesday evening. Manchester Met’s last two fixtures against the University of Liverpool and Newcastle 3rds were both postponed either side of the Christmas break, but despite his side not having played a competitive match since November 28th, Jones has been delighted by their focus. “We were gutted by the postponement,” Jones said. “Newcastle were also keen to get the game on [last week] and there were no fears about their journey. “It has been a long time since we last played! Our last BUCS game was actually at the end of November because our 5th of December game was postponed due to the torrential weather! “It has allowed us to get in the gym and continue to work hard as we have been doing all season. We have been back in training since the 7th of January and the hunger of the players to succeed and work hard has been spot on. Jones will be hoping to see the benefits of their break as MMU look to build on a very strong first term. After securing promotion last year, the men from Platt Lane currently sit third in Northern 1A and six points behind league leaders Newcastle 2nds, but MMU have two games in hand. MMU are in BUCS Trophy action against Strathclyde this week and another promotion, alongside a strong cup run, seems firmly on the cards once again. “We set our goals to be competitive and to challenge for top two,” Jones said. “If we win our games in hand, we will be top. The boys have set their goals and they want to go all the way in both the league and cup. “When we last spoke, you said we had gone on a long run of unbeaten matches and in the next game, we lost 19-14 to Newcastle 2nds! That wasn’t in the plan! “We went up to Newcastle with a lot of lads who weren’t first teamers. We had lot of injuries and a lot of unavailability’s that day, but we did enough to win it. We had a lot of possession and dominated set-piece, but they got three breakaway tries. Promotion and setting high standards is something which MMU have strived towards over the last few years and the evidence of progression is clear for all to see. 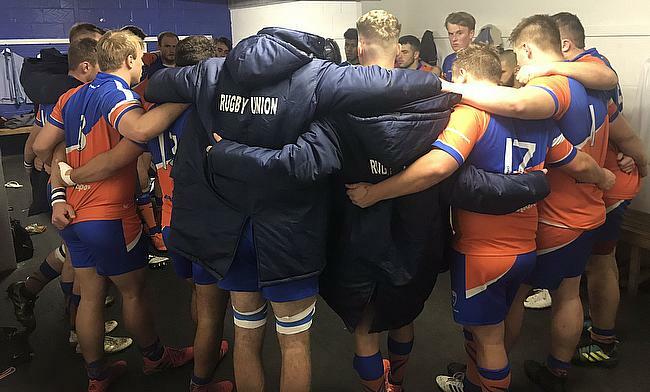 Their growing link with Sale Sharks is continuing to flourish and players are benefitting from their time at MMU with the likes of Ollie Glasse being named in the recent England Students training squad. “What does any student athlete want?” Jones said. “They want opportunities and I think we have proved now, certainly over the last three years, that if you come to Manchester Met, you are going to get the pathways and the doors are going to be open for you. “Ollie is an example. He is doing tremendously well. He has come on leaps and bounds. He is a great athlete who looks after himself really well and he has certainly been encouraged to pursue England Students. It’s the same with the Lancashire lads and same with the lads who represent Sale Jets in the A League and we have a few of those lads coming to us in September as well. “I am always on the phone to other coaches and other institutions to see what they do well and what we can learn. Jones’ current squad are now preparing for their last 16 BUCS Trophy tie against Strathclyde and MMU have had a good relationship with the cup competitions over the last couple of seasons. They won the Northern Conference Cup in 2017 and 2018, but following their promotion, they are now competing at a higher standard. Strathclyde ply their trade in North B, a league above MMU, and with this cup clash to come on Wednesday before a top of the table battle against Newcastle 2nds next week, Jones knows side must stay concentrated. He added: “It doesn’t matter what you have done in term one. Yes, we have set ourselves up nicely and we are in a position we would have taken at the start of the season for sure, but it is about carrying on that performance. There are no easy games in this league and Strathclyde in the cup will be tough because they are in the league above. “We know that Newcastle won’t want to come to us either. They will look at us as a daunting challenge, but we have got to go out there and do it.